eManifest Filing Services | ABC Customs Brokers Ltd. The Advance Commercial Information (ACI) program provides Canada Border Services Agency officers with electronic pre-arrival cargo and conveyance information so that they are equipped with the right information to identify health, safety and security threats related to commercial goods before the goods arrive in Canada. ACI eManifest requires highway carriers to transmit their cargo and conveyance data to CBSA for Canada-bound crossings, no less than 1 hour prior to arrival at the border. ACE is the equivalent U.S. program. From May 6, 2015, to July 10, 2015, the CBSA will provide carriers with a period of transition during which penalties for non-compliance will not be issued. The Agency will work closely with carriers on corrective measures to help them comply with eManifest requirements. From July 10, 2015, to January 10, 2016, carriers who do not comply with eManifest requirements may be issued zero-rated penalties (non-monetary) under the CBSA's Administrative Monetary Penalty System (AMPS). Beginning January 10, 2016, carriers who do not comply with eManifest requirements may be issued monetary AMPS penalties. Full-service filing as primary service provider - For carriers who would prefer ABC Customs Brokers to file eManifest on their behalf. Full-service filing as secondary service provider - A backup option for carriers that are registered with another third party service provider, or who plan to use the CBSA web portal in the event of system failures, power outages, internet connectivity issues, etc. 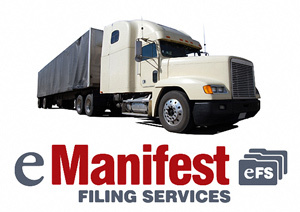 Self-filing (partial) - For carriers choosing to enter eManifest data themselves. Note: ABC Customs Brokers will include 24/7 operational support with either of the service options listed above. Download the ACI eManifest setup package for shipments into Canada. Fill out the forms in the package. Submit the completed forms to ABC Customs Brokers. Submission instructions are stated in the package. For more information or to set up your eManifest account call our toll-free number at 888.538.1566 and speak with our Carrier Relations Liaison today. To file for a carrier code you must apply directly to the Canada Border Services Agency. You must fill out a Carrier Code Application and email [email protected]. If you have questions, call toll-free 866.749.6623. ABC Customs Brokers offers assistance with the carrier code application process. Please contact our Carrier Help Desk at 855.542.6644 or [email protected] for more details.